Mary and Elizabeth were cousins – first cousins, once removed, to be sure. Elizabeth was 11 years older than Mary and the two never met, not even at a family picnic. Eventually Elizabeth signed Mary’s death warrant and the latter was beheaded as was the fashion of the time. These women were no ordinary mortals. Mary was Queen of Scotland and France and with some luck may have become Queen of England as well. Cousin Elizabeth I terminated that ambition with an axe. All of which is just fine except for the fact that the two never met. Friedrich Schiller did not like that either and solved the problem in 1800 by writing a play in which the two queens did meet and au revoir historical accuracy. To be fair, Schiller was more interested in examining philosophical questions such as free will and acceptance of responsibility. Questions like was Elizabeth a prisoner of circumstances and was she able to exercise her free will when she decided upon the fate of Mary? Did she accept responsibility for her actions? Did have one up morally by accepting responsibility for the murder of her husband? Heavy stuff. A few decades later Giuseppe Bardari, a 17-year old writer (and future chief of police of Naples) fashioned Schiller’s play into a libretto for Gaetano Donizetti and after a somewhat tortuous history it did become his 43rd opera. Schiller’s philosophical baggage was blown away by Donizetti’s marvelous music as was all pretense to historical accuracy. 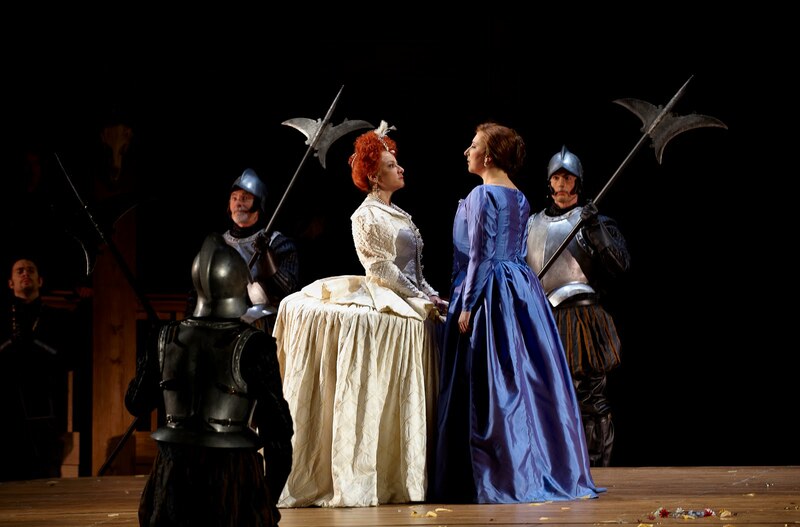 Sadly enough, this is the first time that Maria Stuarda has been produced in Canada. Maria Stuarda is far from being the best work in the bel canto repertoire but it has enough beautiful melodies and choruses to make you want to see it again and again. The opera has two major soprano roles in Mary and Elizabeth. The merciless Elizabeth is frequently sung by a mezzo but a soprano with a reasonably big voice and sense of drama is perfectly acceptable. Bulgarian soprano Alexandrina Pendatchanska has a lovely, creamy voice that may be just a tad small for the role. She sang beautifully but was short of the dramatic expression that the role demands. The dramatic passion that Pendatchanska lacks, Italian soprano Serena Farnocchia possesses and delivers in the title role. I wished that the two had changed roles. Farnocchia would have delivered the fire power that Pendatchanska was short of and the latter would have been a sweeter Mary. American tenor Eric Cutler was a competent Leicester but he has some awkward walking habits. He is a heroic character (both women love him) but he gave the impression of someone who was not quite sure of his footing. American baritone Weston Hurt was a solid Lord Cecil as was bass-baritone Patrick Carfizzi as Talbot. The set by Benoit Dugardyn looked like the interior of an Elizabethan theatre. There is a raised stage in the middle and curtains that are opened and closed reinforcing the idea of a theatre. The set gave the production a nice Elizabethan flavour but the drawbridges that were raised and lowered somewhat haltingly were not as successful. The costumes designed by Ingeborg Bernerth and worn by Elizabeth and her retinue looked like round coffee tables (wobbly dining room tables was my companion’s description). Paintings of Elizabeth I and ladies of the court do show such dresses but somehow they looked rather awkward in this production. Director Stephen Lawless made the singers lounge on the steps of the raised stage a bit too often, I thought. But this is bel canto and you have to let the singers get their notes out instead of worrying about plot and such minutiae as acting. There were some highly effective scenes including the final tableau where Mary raises her arms as if she were crucified. Antony Walker conducted the Canadian Opera Company Orchestra and the COC Chorus was simply outstanding. By the way the meeting between Mary and Elizabeth is relatively short but it does give an opportunity for some fireworks. Go for the whole opera and not the imaginary confrontation. The important thing is that we finally got a Maria Stuarda in Toronto and a very good one at that.